The last thing you or anybody else thought they needed was yet ANOTHER Mazinger Z figure. If you have been a Japanese toy collector for any amount of time you no doubt have a few in your collection already. Mazinger is an iconic figure, setting the template for super robots that exist to this day. But how many do you really need? Mazinger Z should need no introduction, but this version warrants a bit of backstory. In 2009, Dynamic produced a new Mazinger series called Shin Mazinger Shougeki! Z Hen, or "True Mazinger Shock! Z Chapter". In Japan it was promoted as Mazinger Z on TV. The show is a re-telling of the classic Mazinger story, with some subtle differences in design and story. It is not a sequel to to either Mazinger Z or Mazinkaiser - this is something different. Coincidentally, the premiere of this show coincides with the 35th anniversary of the release of the first Mazinger Z Chogokin toy. So, in commeration of the two events, Bandai decided to release a new Soul of Chogokin Mazinger Z. Now, you may wonder why do you need another Mazinger SOC? You've already got the GX-01, GX-01R, GX-07, GX-07I and GX-07E. We'll, here's why. It's been 10 years since that first SOC came out, and toy design has evolved a lot in that short span of time. Bandai has learned a lot, and what collectors want has changed as well. With the advent of Revoltech and Figma, collectors now demand extreme articulation in addition to the typical SOC workmanship. The new Mazinger Z Chogokin was revealed at the 2009 Tamashii Expo and it laid bare all of Bandai's hard work. 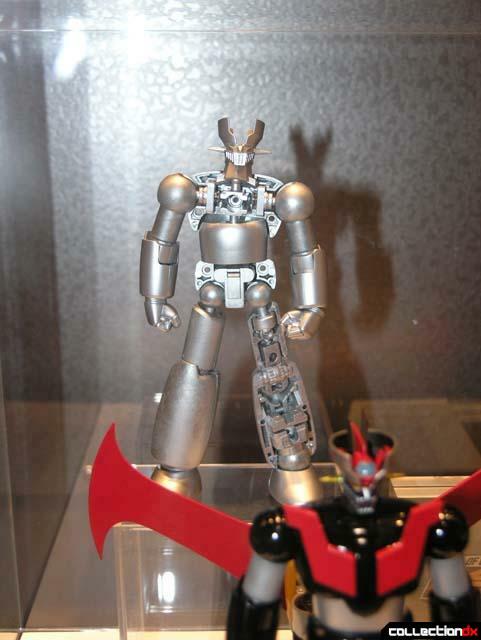 This new Mazinger was more articluate, more anime-accurate, and more metal, albeit smaller than its brethren. This is the one you wanted to have 10 years ago. This is the one you need now. With the anniversary comes a redesign, and the Soul of Chogokin Box is no exception. The Box bears little resemblance to the first SOC, with only the logo and numbering system to relate the two. This package has shiny foil lettering and an awesome, old-school cutaway diagram of Mazinger on the side. Inside the box is a mixture of old and new. Mazinger Z himself is secured in a styrofoam sarcophagus, the only material to pack a Chogokin in. Unfortunately, the accessory trays are clear vacu-formed plastic. Preconceived notions about the overabundance of Mazingers aside, this is one great SOC. It has a very satisfying feel to it. It's very heavy and glossy, with an automotive like finish. The toy is mostly metal, with plastic in the head forearms and hands. That's it. It is truly Super Alloy. The main draw of this Chogokin is the new improved articulation. As you can see in this cutaway, The joint structure in this toy is radically different than those before. Starting at the head, you now have ball joints at both the neck and the base of the head, allowing Mazinger to move in almost any direction. There is a small plastic hover pilder that can plug into the head. This Pilder is now hard ABS plastic with a transparent window and articulated wings. The connection with the Hover Pilder and the Head is a little weak, one of the few flaws with the toy. The torso is three parts, with an upper chest ball joint, swivel waist, and solid metal hips. The hips feature an extending mechanism that allows for a greater range of motion in the leg area. The legs are all metal. The unpainted metal ball joints at the hips look great and solid. These then have a swivel pin joint into the upper thigh which can also pull out a few milliliters, although I don't know if its supposed to. From there the upper thighs are diecast with slightly weathered paint applications. The lower legs are also metal, and these are equipped with collapsible back panels that allow Mazinger to really bend at the knees. Its a great engineering job for a fantastic effect. The feet are on ball joints and those too can extend to provide a greater range of motion. The bottom of the feet have great detail molded into them. Back up to the arms, they are attached to the body by a clicky ball and swivel joint. The upper arms are metal and feature cavities to plug the lower arm sections into. For the lower arms, you have the choice of two options. Normal or Rocket Punch. The normal arms have an elbow joint that end with a magnet. The elbow joints are interesting due to a panel that separates midway through bending the arm. This does not give any more movement than the standard SOC arm joint, but it does look neat. The Rocket Punch arms consist of two launchers and two forearms. The launchers have magnet ends to attach to the upper arms and have a small trigger. Simply click the arms into the lanucher and press the button to fire. The trigger is really small so it is hard to get this to fire every time. Once you do fire, they have a fair amount of force, and will travel a few feet. Both the regular and launching arms can be outfitted with any of the four variant hands. The hands pop on and off balls at the end of the arms easily. But what would Mazinger Z be without his Jet Scrander? In the past, The Jet Scrander was made so that the wings could be placed in different positions for different modes. While this was a neat gimmick, the wings were pretty ugly. This new version manages to combine style and function. There is some assembly involved with the Scrander, namely the tail fin and the wings. The wings are designed in such a way that to change modes (flying or... not flying) all you have to do is remove and swap the wings. Now it looks great in both modes. But don't forget to move the yellow jet sections forward or backwards depending on the mode. The whole assembly attaches to the figure by the belt, which wraps around the waist and attaches in the front. A small peg in the back fits into the hole on the back of Mazinger. When not in use, the Jet Scrander can be stored on the display stand using a special attachment. In addition, the stand can be re-configured with a different attachment to display Mazinger Z in flight mode. The stand itself is pretty basic, with the engraved nameplate, options for storage, and grooves for the feet. The only letdown is that there is no place to store the additional stand parts when not in use (unless I didn't look carefully enough). Now that I have handled this, I can say YES it is very cool and worth getting. Get this one and sell the others, because this is the one you need. Its also worth noting that this is the first official wide release of a Bandai Tamashii product through Toynami. It seems plans to make these be released through the Masterpiece line with Masterpiece packaging have been abandoned. This toy is released in the same package as the Japanese Market release. Wow! I can't wait to pick this one up! Honestly they could never release too many Mazinger, it's always a cool design that I simple can't get sick of! Keep bringing them on, especially if they look like this. I so very much want this, but have been waiting for the US release. Where can I actually get one at a brick and mortar store? You *should* be able to order it at your local comic shop. I say *should* because some retailers are too lazy to open up a copy of Previews, do some clicky-clicky on the computer, or order anything other than Wolverine busts and half-naked women. I was thinking about it, but will wait for the version with the big hand...Josh did you get your free gloves and cloth??? gloves and cloth only come with the Asia release. No white gloves for yankees! Most US folks have been skipping collecting the extras for years now. I don't own a Mazinger but have like over 15 SOC's in my collection. Nice review. I'll pass on the fist Mazinger and pick-up the new Getta Dragon when he goes on sale he's still not as impressive as the previous Getta Dragon but cool. Josh you say Big-O won't be sold in the states can't he be bought through one of the sponsors on your site Hobby Japan? Will the Toynami release have a lower or equal price than its Japanese yen price? US ver is about $69.99, so comparable price, but cheaper shipping because its not coming from Japan. Honestly this is THE best mazinger z in IMO,its pretty damn articulated and beautiful by looking at the video D:!!! my wife saw me watching the commercial over my shoulder, her eyes went wide, identifying with the japanese buisnessman, saying "That's me!!" - an experience tons of 30-something japanese have probably been having too watching the tv spot. But as soon as she saw the white gloves, and the awesome 70's stop-motion posing, she had to have one. "You're getting the one that comes with the gloves, right? You can't skip out on the gloves!" When they introduce a Mazinger SoC that doesn't require swapping out forearms to have Rocket Punch capability, I'll call that "done". Not a single iteration sooner. and got the "free gift" white gloves and cloth, as I live in Bangkok. Only one hover plider? Thats a little lame, if you want to display it on the stand then there is not one in Mazinger's head. And don't lose it! because, it really really is loose. That jet scrander really rocks though. All in all no regrets and a must buy if you need another Mazinger. Bandai really put some soul in this chogokin! Can't wait for GX-51 Getter Dragon and GX-49 Shin Mazinger Z! I personally think that the GX 01 is still the best! Not only is the history value there (first SOC), but I gots to have my NAVAL MISSILE! Come on now. Updated GX-01 Mazinger Z SOC review this week! I will be getting this one instead. Sooo glad I waited for this release! Got both GX-45 and 49 for what it's worth, GX-45 is more articulate than 49 but the GOD SCRANDER evens it up!! Well I just got my pre-ordered God Scrander edition. Yep maltagokhin is correct, The entire lower legs and feet are molded plastic??? How the hell can Bandai do this to us? I am serious, Really! For that kinda cash I want answers. What an underhanded switch out! Who the hell would have guessed that kinda crap was on the table at pre-order time? Don't go telling me it has to do with the small slots to engage the tabs on God Scrander- (not buying that). One word: OUCH. Check out your feet on this guy. Any plastic sprue flash on the bottom edge of the back of the feet? I suspect they are indeed plastic but I don't have this version to confirm. I can easily feel the temperature difference between the plast.-vs-metal on GX-47, and GX-51. If so... please update this review to reflect the actual metal/plastic content. It is indeed an important factor in the world of high end chogokin. Thanks.